Currently, healthcare providers are transforming their healthcare infrastructure from a volume-based model to a value-based one. With increasing patient data, healthcare providers are today struggling to manage and aggregate the data to generate valuable insights. 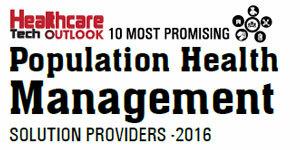 Population Health Management (PHM), being the centerpiece of value-based care, brings in analytical solutions that support the patient, healthcare providers, and administrative process management team. Headquartered in Alpharetta, GA, Wellcentive provides end-to-end PHM solutions to healthcare institutions to manage care process for populations. Wellcentive’s approach to PHM is provider-facing, economical, and draws on the data their clients already have. The company’s PHM solutions are cloud-based, flexible, and customized to fit the convenience of the healthcare providers and payers. “Every-thing at Wellcentive the products, services, insight, and culture has been designed to support the journey of a healthcare organization to value-based care,” states Tom Zajac, CEO, Wellcentive. “Our entire team stands ready to partner with our customers to accelerate the transformation required to improve quality and drive revenue, delivering sustainable financial, clinical and human value,” he adds. Wellcentive’s analytical solutions simplify complex data across various sectors which include health systems, IDNs, and CINs, physician organizations, accountable care organization, and Chronic Care Management (CCM). The company generates actionable insights into clinical and utilization metrics, delivers and documents the required care management services, and avoids payment penalties, and effectively capitalizes on the payments and bonuses offered by public and private payers. The company’s tried and tested PHM program gives real-time insights to both clinicians and administrators and allows them to identify and address care gaps within the patient population. Wellcentive believes that a well-developed care management program is the key to better outcomes and cost savings, especially in populations with chronic disease. Wellcentive provides easy-to-understand dashboards that allow stakeholders to quickly identify outliers, assess the effectiveness of initiatives, and reduce variations in care. These tools help assess how providers are performing for each of the many different quality programs and measures typically in effect for an organization at any given time. Owing to the company’s prowess in delivering effective PHM solutions, Wellcentive has been constantly focusing on delivering customer success and outstanding customer experience and value. Blanchard Valley Health System, a non-profit provider of an integrated regional health system, utilized Wellcentive’s PHM solutions for their employer-based medical home initiative. Wellcentive enabled Blanchard to amass data about the population from multiple sources and help them establish and maintain an effective care management program. The company's approach in delivering exceptional clinical and business process expertise and insight, innovative solutions and services to guide their customers achieve improved clinical, operational, and financial performance serves as a key differentiation factor. Wellcentive aims to continue to lead the PHM landscape through unparalleled innovation and partnership with their customers, changing the face of healthcare and driving superior clinical, financial, and human outcomes. “At Wellcentive, we believe we have not only the opportunity, but the responsibility, to drive the transformation of healthcare,” Zajac concludes.